Asian Americans not immune from gun violence, so why no mention in Obama’s CNN gun show? I hate guns. But I hate wimpier attempts at gun control more. And President Obama’s latest attempt is so modest, so restrained, it hardly makes the NRA quake in its boots. Even the president admitted, it’s hardly a conspiracy to take away anyone’s guns. It’s really just a first step to a relatively empty gesture. More background checks are nice, but they wouldn’t have prevented the most newsworthy shooting massacres of modern times. More concerning is that Asian Americans were left out of Obama’s big town hall on guns ballyhooed on CNN. And I had my Asian American detector out. It felt like I was watching some cop show on network TV. There in the back row, like an extra in a Hollywood TV or movie production, Asian American #1. I didn’t see any other Asian Americans. Did you? Once again, we don’t count, as if Asian Americans aren’t affected by guns in America. After the San Bernardino shootings on Dec. 2 (perpetrated by two South Asians), the Los Angeles Times went back to 1984 and counted the most notable mass shootings in America. 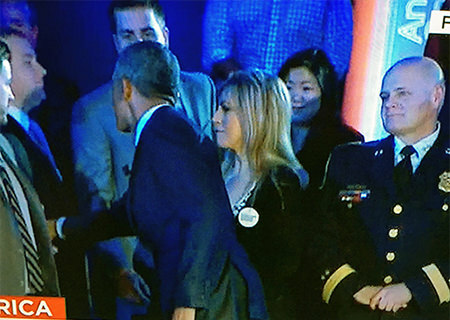 The CNN/Obama event included mention of Newtown, Conn., where 27 were killed, one injured, on Dec. 14, 2012. The CNN show even featured former Arizona Rep. Gabrielle Giffords, a survivor of the Jan. 8, 2011 attack that killed six in Tucson, Ariz. But that’s just two of the 45 on the notable list, which also includes the Colorado shootings in Columbine and Aurora. Among the others on the list, Asian Americans were on both sides of the barrel, as shooters or victims, in at least nine of the noteworthy shootings since 1984. And wouldn’t it be just like us to be No.1? How soon we forget April 16, 2007, when Seung-hui Cho, a 23-year-old Virginia Tech senior, went on a rampage killing 32 and injuring 17. And then he sent videos and manifestos to NBCNews. Cho purchased everything legally and even passed a background check. But he also failed to disclose being an outpatient in a mental health program. That might have been relevant to the discussion, considering the Obama plan’s component to fund mental health programs. But maybe people just want to forget Virginia Tech for wrecking the grading curve. So what about the April 3, 2009 shooting in Binghamton, New York, when Asian American Jiverly Voong shot and killed 13 people and injures four? That shooting even had a Filipino American victim. Or how about the mass shooting on Aug. 5, 2012, when Wade Michael Page, a white supremacist, fatally shot six people and injured four others at a Sikh temple. President Obama might have included a Nov. 2, 1999 incident, in the president’s other home, Honolulu. On that day, Bryan Uyesugi, a copier repairman, shot and killed seven co-workers with a legally-owned Glock. Even with a background check disclosing mental issues, he was allowed to obtain guns. He’s now serving a life sentence without possibility of parole. That’s more than enough for inclusion on a CNN show, don’t you think? We don’t even need to mention the recent Asian American victims: Jennifer Markovsky at the Planned Parenthood shooting in Denver, or Tin Nguyen in San Bernardino. Or the rampage in Isla Vista, Calif., on May 23, 2014 of half-Asian Elliot Rodger. The Los Angeles Times list also includes the schoolyard shootings in Stockton, California, Jan. 17, 1989, when Patrick Purdy killed five people and injured 32. His victims were mostly Southeast Asian refugees. In schoolyards, dormitories, immigration centers, workplaces, birth control clinics–you name it, Asian Americans have been on both sides of the gun debate, as victims and perps. I’ve got my own issues with Obama’s executive initiatives. For example, what good are background checks when more and more people are allowed not just concealed carry, but to open carry weapons? The president acknowledges he can’t do anything about accidental shootings. But what about the laws that protect gun owners who mistakenly shoot the wrong people, then hide behind broad self-defense laws? It’s the reason my cousin, Stephen, is dead and his killer was allowed to go free. I would have wanted to let the president know a thing or two. But it doesn’t seem like they were letting Asian Americans in the studio. Pre-show, post-show. Not even the show show. I saw one Asian woman. Did I miss anyone else? A cameraman? Maybe it was just easier for CNN to round up white and black folks to discuss guns and violence because that fulfills the stereotype. Simpler just to exclude Asian Americans. Maybe it’s an accent thing? But the message is clear when it comes to public policy yet again. On many important social issues of our day, we still don’t count. Every time it seems like we’ve gone beyond the “inclusion thing,” there’s always a reminder that we haven’t. That Los Angeles Times list of shootings shows at five percent of the country, Asian Americans are outpunching our weight class. Yet somehow, we still don’t rate a peep when it comes to a town hall on guns in America. That should have been easy. A lot easier, say, than getting Congress or local and state lawmakers to make a real difference and act beyond the president’s meek initiatives.